On January 21st, 2013, President Barack Obama was sworn in as the 57th president of the United States of America. I tuned in to watch the highlights of both the inauguration, and of course, the inaugural ball that was held tonight. My main focus was on the ladies' fashion, including first lady, Michelle Obama, and herr two daughters, Natasha and Malia. The inauguration took place this morning outside the White House in Washington D.C., so obviously the weather was a bit chilly. Michelle kept herself warm in a custom silk, navy, checkered coat by Thom Browne. The belt and shoes she wore were by J. Crew and the small pop of color came from her magenta gloves. Malia, the oldest of the two daughters, wore a violet J. Crew coat, while Natasha wore an indigo Kate Spade coat. The color choices of the two coats were extremely complementary of each other and were a great choice for the occasion. I also couldn't help but notice Beyonce's amazing ensemble. She looked (and sounded) amazing when she sang the National Anthem in a Pucci dress, Christian Dior coat, and Lorraine Schwartz emeralds after the president was sworn in. I absolutely loved the detailing throughout the dress. The pop of green from her emerald jewelry was the perfect pop of color. 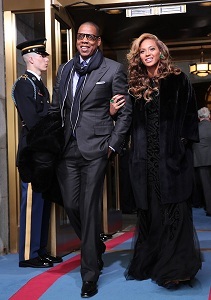 She looked both elegant and fashionable on the arm of her hubby, Jay-Z. 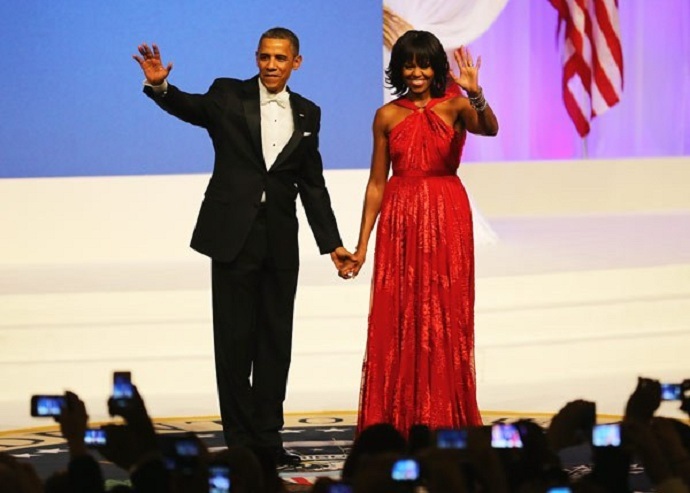 And of course, I was extremely excited to see what the first lady would be wearing at the 2013 Commander-In-Chief's Inaugural Ball. There had been rumors flying around that she was choosing from a flurry of high-end designers including Tory Burch, Michael Kors, Tracy Reese, Marchesa, and many more, but she ended up choosing Jason Wu...the same designer that she used for the last inaugural ball in 2008. The scarlet, velvet and chiffon halter-style dress was stunning, although I would have liked it so much more if it were strapless. The dress was gorgeous, but I think the halter top style made it look much cheaper and not as formal. Did you love the inauguration fashion? Did you like Michelle's dress this year or in 2008 better? 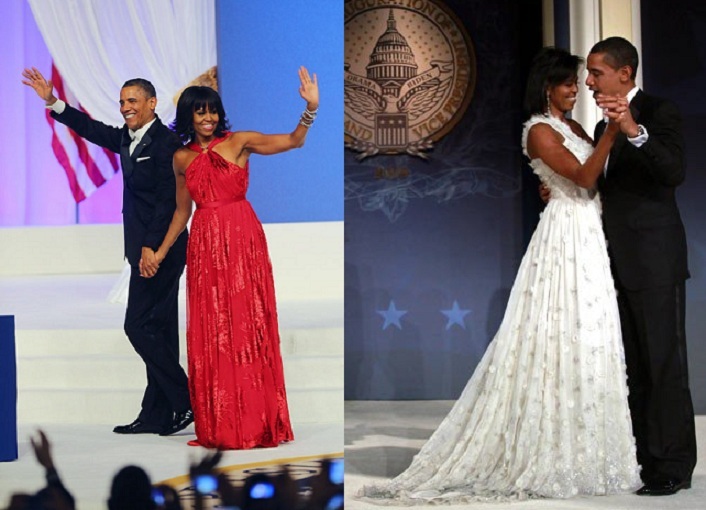 Michelle's Jason Wu gown this year compared to her white Jason Wu gown in 2008. Which is better? Micheles coat was amazing. I have found you through the Lauren Conrad website, and I love your blog. Would you like to follow each other. Just leave a comment to let me know. I love the girls' coats. They're so pretty. The 2 girls looked really pretty!! Os presento el nuevo gesto de moda. I LOVE Beyonce! Michelle has great style, I love both dresses equally! they are the epitome of perfection. I love her style and the new hair cut she's wearing. It's extremely flattering and make her looks younger!! BTW would you like to follow each other on GFC and Bloglovin?? Feels good to have such stlylih people in the White House ;) Michelle's bangs are workin' for me. The thing I love about the Obama's is that they are relate-able. Like yes Michelle is the first wife but she has style and that style is today's modern woman. I love that she pulled things from her closest like the JCrew gloves and belt (which was from a dress). Clever. I think so. beautiful dresses! !Visit http://www.urbanfashionstylee.blogspot.mx and check my new post!! I loved the fashion as well especially the First Lady's ball gown, it was stunning. 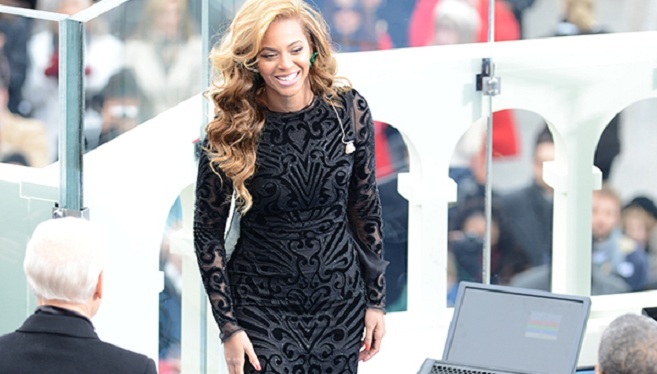 Beyonce is a DIVA! everything looks amazing on her. Beautiful woman and gorgeous singer. Jason Wu's dresses are so good, he is talented and creative. You are welcome to visit the MAC lipstick giveaway now on my blog! 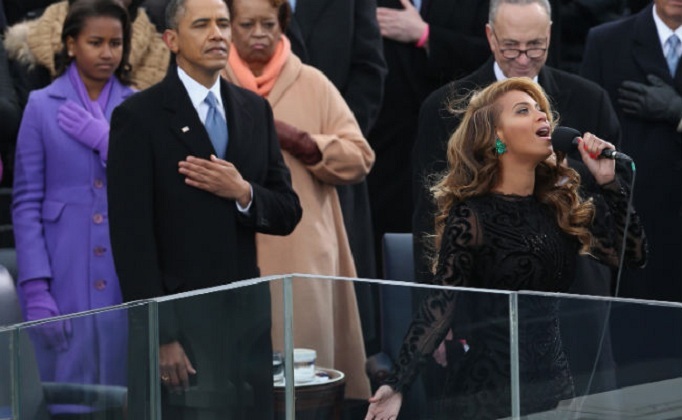 I actually liked Jill Biden's getup best, although Beyonce does look HOT! The girls are so adorable, they're turning out so well! The red dress was amazing! I saw you on LC forum so I came to see your blog, let me tell you that you´ve done a great job with it, please come visit and if you like it it would be great if we could follow each other here or socials, what do you think? To support each other… let me know ok!